BESTEK Air Fryer allows you to cook all of your favourite meals with fewer calories and the same good taste, but in a healthier way. The Rapid Air Technology lets you fry with air to make food that is crispy on the outside and tender on the inside. This offers a way of having your favorite meals fried, grilled, baked or roasted; but with fewer calories and the same good taste. 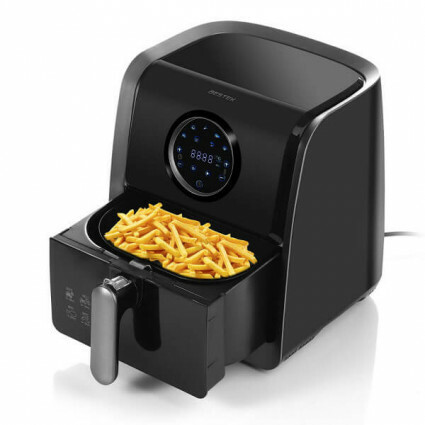 Adopted advanced Air Fryer's Rapid Air Technology, you can fry, bake, roast and grill tasty snacks and meals with fewer calories and less smell than conventional fryers. The dial display is quick and easy to use. Just set to the temperature and time needed and the Air Fryer will do the rest. You can cook smartly in 7 programs (Chips, Chops, Chicken, Steak, Shrimp, Bake and Fish). You can set cooking time with up to 60mins and pre-set the best cooking temperature up to 220 degrees to make your own favorite food. The large 3.2L cooking capacity adds to the convenience of this appliance as you can make large quantities of food in one go. Cleaning the Air Fryer couldn’t be easier. Just remove the coated draw and the food basket and place in the dishwasher for cleaning.